The Jewish boxer who helped turn tide of WWI ■ A former Mossad head has joined controversial Israeli spy firm Black Cube ■ Why is Israel tossing a lifeline to Jamal Khashoggi’s killers? VETERANS DAY — The Jewish Boxer Who Helped the Allies Turn the Tide of World War I — by Matthew Pearl: "Benjamin Kaufman, a tenacious boxer from Brooklyn, stuck by his men and never shied away from a fight. His grit helped America win in the Argonne. Born March 10, 1894, Kaufman spent his earliest years on a farm upstate before the family settled in Brooklyn. Between his foreign heritage (his parents came from Russia) and being Jewish—not to mention his eight older siblings—he had to learn to defend himself. “Unless you could fight in East New York in Brooklyn at that time, you just didn’t have a chance,” he later recalled." Jackson Diehl writes... "Why is Israel tossing a lifeline to Jamal Khashoggi’s killers? Netanyahu’s problem is that in betting so heavily on Mohammed and Trump, he took a large risk with two very unstable actors, each of whom has polarized their political systems. If Mohammed survives... he will be weakened and wary. He won’t be able to deliver the Palestinians for Trump’s peace plan... Trump, too, has been weakened by the Democrats’ capture of the House of Representatives — and so has Netanyahu." 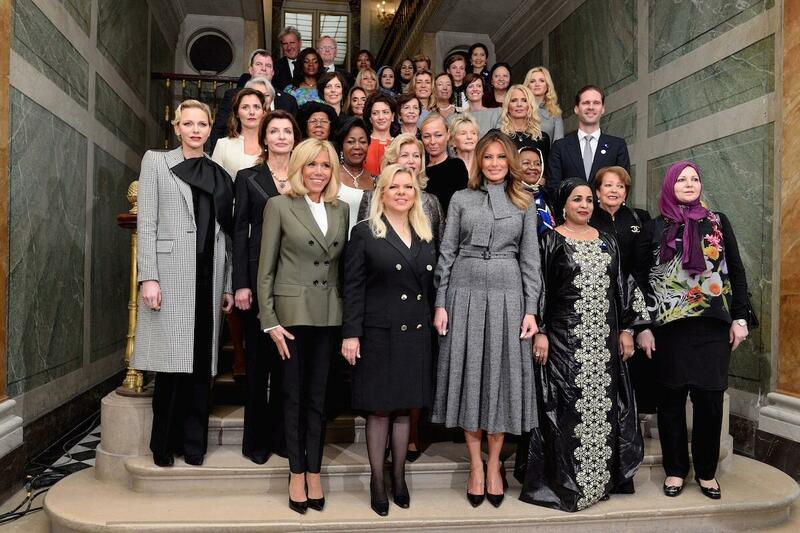 PIC OF THE DAY — Sara Netanyahu took a prominent place on the world stage in Paris yesterday when the spouses of the world leaders posed for a group photo in the Palace of Versailles. COMING SOON – Vice President Mike Pence will deliver the keynote address at the annual conference of the Israeli American Council on Friday, November 30th, in South Florida. The IAC is largely funded by Sheldon and Mirian Adelson. HAPPENING TODAY — Pastor John Hagee, founder of Christians United for Israel, will be honored for his 60 years of ministry at an event hosted by CUFI in Jerusalem. Ambassador David Friedman is expected to deliver remarks in honor of Hagee. "The State of Israel is fortunate to have you on our side," Israeli Prime Minister Benjamin Netanyahu is expected to say in a video address, according to excerpts obtained by Jewish Insider. — During the campaign, Rohrabacher came under fire for attending a fundraiser with an alleged Holocaust denier and endorsing an alt-right activist criticized for anti-Semitism. "It’s clear that Dana Rohrabacher has embraced anti-Semitism and individuals who support it,” Rouda charged in an interview with Jewish Insider last month. INSIDE THE WHITE HOUSE — A White House Challenge: Balancing the Roles of the First Lady and First Daughter — by Maggie Haberman and Katie Rogers: "As her role has evolved, Ivanka Trump has let family friends know in the clearest terms that she is in the White House to help her father by using her charm and contacts to cut through Washington’s bureaucracy, particularly with Congress... Like her father, Ms. Trump is acutely aware of her news coverage: A rotating cast of White House aides have often tried to get her credit in the news media for issues she has worked on. Her meetings are often summarized by the White House press office and emailed to reporters, a move that is not routinely extended to other senior advisers to Mr. Trump." — Amy Spiro tweets: "Last month, visiting Israel, Gerard Butler said he hoped his house in Los Angeles would burn down so he'd have an excuse to stay in Israel. This week... Gerard Butler's house in Los Angeles burned down." SPOTTED: NYC Council Speaker Corey Johnson, Brooklyn District Attorney Eric Gonzalez, Councilmembers Justin Brannan, Barry Grodenchik, Karen Koslowitz, Mark Levine, Ruben Diaz Sr., Daniel Dromm, Rafael Espinal, Robert Holden, Rory Lancman, Carlina Rivera, Ydanis Rodriguez, Helen Rosenthal and Alika Amprey Samuel; Assemblymembers Steve Cymbrowitz, Rodneyse Bichotte, Michael Blake, Nily Rozic, Alfred Taylor, Latrice Walker and David Weprin; State Senator Mike Gianaris, Rabbi Michael Miller, Jason Goldman, Lew Fidler, Phil Goldfeder, Dave Mertz, Joel Lefkowitz, Tuli Weiss, Jeff Leb, Ben Segal, Zack Fink, Yoav Gonen, and Jennifer Fermino. SPOTTED: Rabbi Michael Miller, David Greenfield, Rep. Nydia Velazquez (D-NY), Rep. Brendan Boyle (D-PA), NY Attorney General-elect Tish James, Andrew Gross, Assemblyman Walter Mosley, Haley Broder, Phil Goldfeder, Councilman Mark Levine, and Jeff Leb.